The strongest pushback on the UNCTAD report came from South Africa (where the study argued that gold exports are largely unreported) and it is still going on. 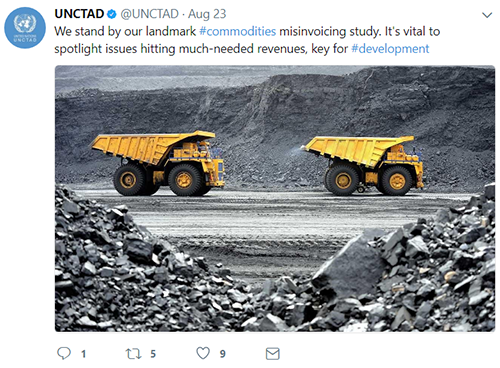 Last week the South African Chamber of Mines published a final report by economics consultancy Eunomix, taking a careful look at the UNCTAD study. The Eunomix report confirms many of the problems with the calculations which have been raised previously, and also argues that these shortcomings effect other similar studies such as those carried out by Global Financial Integrity (GFI) and the UNECA/AU High Level Panel on Illicit Financial Flows. The Eunomix analysis demonstrates that most of the gold discrepancy which UNCTAD interpreted as misinvoicing can be explained by South Africa recording gold exports as “money” while trade partners classified the same gold bars as “non-monetary.” The remaining (and much smaller) discrepancy in the data may be due to gold from other countries refined in South Africa and recorded as South African by trade partners. Similarly, with platinum, a large part of the discrepancy is explained by missing data in the UN database. The remaining difference may be due to Zimbabwean platinum refined in South Africa. Other cases in the report such as Zambia copper and Cote D’Ivoire cocoa highlight a more general problem with “mirror trade data” calculations, which is that ordinary non-illicit trade through bonded warehouses, transit hubs, or “merchanting” hubs (such as by Swiss trading houses) can be interpreted as equal and opposite pairs of illicit trade flows going into and out of developing countries. Eunomix note that if there was customs and tax fraud on the scale that UNCTAD suggests in the South African metals sector, the money stashed offshore it would have shown up in the accounts of major stock-exchange listed companies (certainly market participants have not reacted as if they found the UNCTAD report credible). Eunomix argue that the reliability of the UNCTAD findings matter, firstly for the South African government, secondly for the reputation of the mining industry, and thirdly for the credibility of UNCTAD itself. They say that accusations of extensive misinvoicing are contributing to lack of trust between stakeholders in the mining industry. UNCTAD seems to be confident that they can continue to ignore the criticism and hope it will blow over. This confidence is perhaps based on safety in numbers; other high profile studies have also used similar calculations (for example, it is notable that the same countries and commodities that feature in the UNCTAD study also feature strongly in the calculations of the High Level Panel on IFFs from Africa, and in GFI’s calculation for Africa in its previous reports). irreconcilable issues in the destination reporting of Zambia’s copper exports and South Africa’s gold exports distort bilateral estimates of misinvoicing to such a degree that bilateral estimations of misinvoicing for these countries are of little practical use. They have therefore switched (for these two cases) from their main methodology of comparing trade records bilaterally to comparing countries’ own statistics with partners on an aggregate “world” basis. This eliminates the issue of ordinary trade being classed as capital flight based on destination mismatches. However, for most other countries the higher “bilateral” figure continues to be used, which will tend to generate both apparent illicit inflows and outflows from ordinary trade. They have also introduced a new “low” estimate which addresses another problem: that of double counting in misinvoicing between pairs of developing countries. These two changes have the effect of reducing estimated misinvoicing in South Africa from an average of $21 billion a year to $7 billion a year (between 2004 and 2013), and in Zambia from $3 billion a year to $160 million a year (remember, these are not estimates of revenue loss). Overall the estimated illicit flows due to misinvoicing from Africa falls from an average of $60 billion dollars a year to an average of $32 billion. There is significant downward reassessment from South Africa and Zambia (which went from a “bilateral” to “world” approach) and the significant upward reassessments of Sudan, Algeria, and Egypt (which went from “world” to “bilateral”). GRI also discovered that large amounts gold exported from India to Switzerland which they had counted as “misinvoiced” were in fact recorded in official statistics. This realisation lead them to reduce the estimate for illicit flow from India via trade misinvoicing by 85 percent in the 2017 report, compared to the previous version. All of this shows how sensitive the findings are to methodological choices, and to specific local knowledge not captured in the IMF DOTS database or UN COMTRADE. It is good that GFI has taken some steps to revise its calculations, however these adjustments may pass many readers by amidst the footnotes and tables. A close reading of the latest report shows that GFI’s new estimates no longer support previous claims that have become received wisdom on this topic. 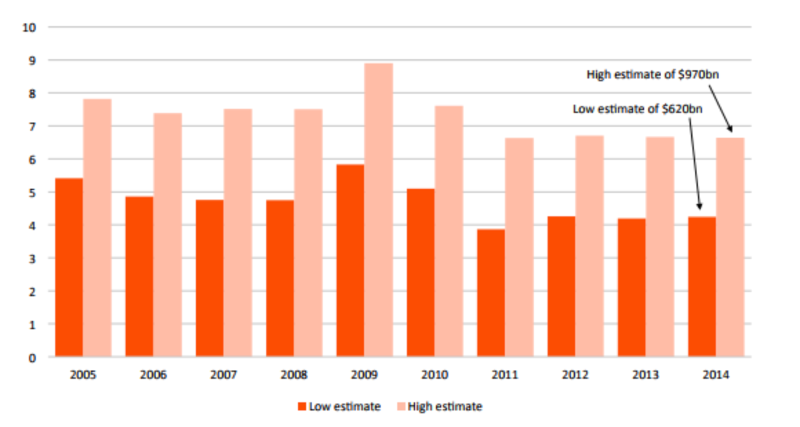 For example, it is often said that because of illicit financial flows Africa is a “‘net creditor to the rest of the world” losing some 6 percent of its GDP, however GFI’s revised estimates now put illicit outflows at some 2 percent of GDP in Sub-Saharan Africa with apparent inflows somewhat higher. It has been said that illicit outflows are growing faster than international trade, but the new figures suggest misinvoicing is, if anything, falling compared to overall trade. Furthermore, several issues remain. For example, the calculations still fail to take into account the monetary/non-monetary gold issue for South Africa. GFI’s new low estimate of outflows through misinvoicing from South Africa gives an average of around $8.6 billion from 2005 to 2010. However, the data on gold exports from the South African Reserve Bank suggest that (non-illicit) exports of non-monetary gold exports might account for around $6 billion of this. While the latest GFI report finally accepts that apparent illicit outflows cannot simply be ignored, it now adds apparent inflows and outflows together. Don’t worry about the numbers? What policies for curtailing IFFs would be changed based upon the most accurate of these numbers? None. The magnitude of the problem is severe at every level. I would argue that relying on bad numbers undermines understanding, debases political debates, and erodes organisational integrity and is likely lead to ineffective action. The high profile estimates have been used to make a case that greater attention should be paid to the misinvoicing channel and less to crime and corruption, but this is not supported by the analysis. Disaggregated analysis of illicit flows and the factors that drive them in individual countries would be valuable, but these studies can run in to tensions if they are expected to find massive trade misinvoicing. The paradox of all this is that these numbers have been valued most strongly as a communication tool for making the case for transparency mechanisms such as public registers of beneficial ownership and country by country reporting. The hope is that these will prove to be breakthrough solutions that enable informed and empowered citizens to hold governments and the powerful to account. But for this to work there needs to be a robust chain of links between raw data, real analysis, and sustained public and political engagement on complex issues. It is hard to reconcile this with the argument that we shouldn’t worry about the analysis. The Chamber of Mines is calling on UNCTAD to acknowledge shortcomings of the analysis and withdraw the report. And it should. When you are in a hole its best to stop digging. But the trade misinvoicing figures more broadly, and the conclusions drawn from them, have become widely accepted through repetition. Many organisations have played a role in constructing this hole in the first place, and they have both a collective responsibility and interest in helping to repair it.